Danish speaker manufacturer DynAudio makes sound systems that are out of this world. Some of the company's older, vintage speaker cabinets are so ludicrously big and powerful that they need separate floor-standing amplifiers just to cope with their wattage demands. Although models in the current range aren't quite as ostentatious, they're still hugely impressive with incredible sound and a price tag to match - think in the region of £10K for a really good pair. Everything is made from scratch in the Skandeborg factory: a three-hour drive West of the bustling and beautiful Copenhagen, and only the highest quality components are used, so you know you're getting what you pay for. The company also offers a premium upgrade sound system for Volkswagen cars, such as the Passat and Touareg, not to mention the Bugatti Veyron (unsurprsingly, as it's owned by the Volkswagen group). It's a clear signal that DynAudio really knows its stuff when it comes to in-car sound technology, and can make speakers for even the best motors in the world. On the journey to the factory, T3 was witness to a demo of a DynAudio-outfitted Volkswagen Touareg. And it sounded really great. Cars, by their very nature, are a nightmare for sound engineers due to a variety of factory-fit anti-acoustic features, such as road noise, unflattering surfaces, awkward angles and poor speaker placement by interior designers. But, thanks to the high-quality of the speakers offered by Denmark's best, and some clever fine-tuning of the DSP (digital sound processing) within the car, the Scandinavian sound bods are able to make the best of a bad situation. Another demo of a Passat DynAudio sound system with standard DSP and DynAudio-tuned highlighted one hell of a difference to the audio quality, with a better sound stage and a much livelier, enjoyable listening experience. 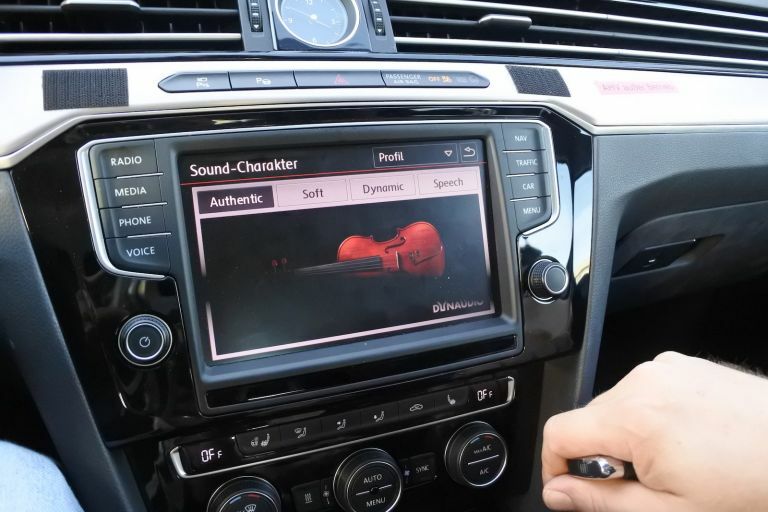 Despite its best efforts, there's only so much you can do in a car, but DynAudio is working hard to address these shortcomings with some pretty fancy tech that it'll be implementing in Volkswagen's cars of the very near future. One of these is noise-cancelling technology - much the same kind you'd find in your headphones. The idea is the same: to block out ambient sounds that lessen the audio experience. Noise-cancelling tech isn't just there to improve your latest Taylor Swift album, however - it'll be influential in making cars safer too. By using a sort of selective noise cancelling, it'll be able to filter through important sounds like the noise of a parent screaming as their child runs out into the road, or the sound of an emergency vehicle approaching. Not only will it be able to filter these sounds, it'll be able to pinpoint them too, as the noise-cancelling tech will focus the direction of the noise using the most relevant in-car speaker. While the learning side of things will take time, the actual hardware is already available. "Noise cancelling in headphones already exists," René notes. "The main challenge is figuring out how to correctly use this technology." The other area of in-car technology that DynAudio is hard at work on conjuring up is zonal audio. By utilising multiple speakers within a car, DynAudio plans to create sound zones for each person inside the cabin. So, someone on the back seat can watch a movie in complete audio isolation, while another in the front can listen to their music or take a phone call without hearing what's happening outside their sound zone. It sounds a bit crackers, but the results - if achieved - will be amazing. "Multiple speakers in a car will always be a challenge," says René. "But people will demand this technology so we must figure out how to make it a reality. Again, the technology is there, but we must work out how to make it possible to implement inside a car." DynAudio is working with Volkswagen to plan for the future, but exactly how to create such a bespoke sound system inside a mass-produced car will no doubt be the hardest task. DynAudio is off to a good start though - the company has already produced its own tailor-made amplifier which has enough power and technology built into it to make it future proof for any potential in-car audio scenario, whether it's noise cancelling or zonal audio. DynAudio is also working out how to make electric cars safer. At present their lack of noise causes a few problems, simply because over the last 100 or so years we've become accustomed to hearing cars as well as seeing them. By using its audio knowhow, DynAudio is planning to come up with a sound which cars can emit to make their presence known. What that sound will be isn't known at present, and it's definitely going to be tricky to find out. Will it sound like a car's engine all of the time, or will it only make a warning sound when the system detects a potential accident situation? Whatever the outcome, one thing is clear: DynAudio is committed to making cars of the future not only more enjoyable on the inside, but they're also going to be safer too - which is a good thing for everyone.